MyTopo.com sells custom topo maps centered on the customer’s choice of location. Until recently, Mytopo’s offerings were limited to the United States. Just this week, MyTopo announced the addition of all 13 Canadian provinces and territories. The MyTopo Canadian system provides access to more than 12,000 new base maps, allowing customers to center a custom map print anywhere in Canada. Each map is available in a variety of sizes from 18″ by 24″ to a huge 36″ x 48″. Available finishes include waterproof synthetic paper, glossy poster finish, and full-seal laminated. Every map is printed with UV/fade-resistant inks. “Those who have planned a backpacking or hunting trip to Canada know it can be hard to find good paper maps,” said Kevin Toohill, founder of MyTopo.com. “We expect the service to be a welcomed resource, and we know map enthusiasts will appreciate our customizing features, our folded, lightweight, waterproof paper option, and our ability to ship the maps within 24 hours.” With the ability for custom-centering and custom-scaling, map buyers have found they can often carry just a couple maps instead of a dozen or more. Canadian topographic maps are based on the 1:50,000 scale, versus the US Geologic Survey (USGS) topo maps which are 1:24,000. MyTopo’s Canadian maps are made from scans of the original Natural Resources Canada topographic maps. MyTopo offers a choice of paper finishes, including waterproof, glossy, and laminated maps. The topographic maps range in price from $9.95 to $44.95, depending on map’s size. For more information, visit <a href=”Canadian topographic maps are based on the 1:50,000 scale, versus the US Geologic Survey (USGS) topo maps which are 1:24,000. MyTopo’s Canadian maps are made from scans of the original Natural Resources Canada topographic maps. The maps can vary between metric (meters) and English (feet) units. Newer maps are metric. The datum of the original maps also varies between the older North American Datum of 1927 (NAD27) and newer NAD83 maps. Universal Transverse Mercator (UTM) grids are pre-printed on ALL of the Natural Resources Canada base maps. MyTopo’s Canadian topographic maps range in price from $9.95 to $44.95, depending on map size. For more info, visit MyTopo.com or call 1-877-587-9004 (toll-free). 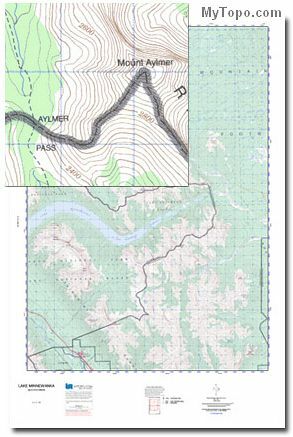 Share the post "Custom Topo Maps for Canada Offered"